Dec 16, 2015 – TORRANCE, Calif. The stylish and versatile 2016 Honda CR-V (http://automobiles.honda.com/cr-v/), has received a 5-Star Overall Vehicle Score, the top score available in the National Highway Traffic Safety Administration (NHTSA) New Car Assessment Program (NCAP). 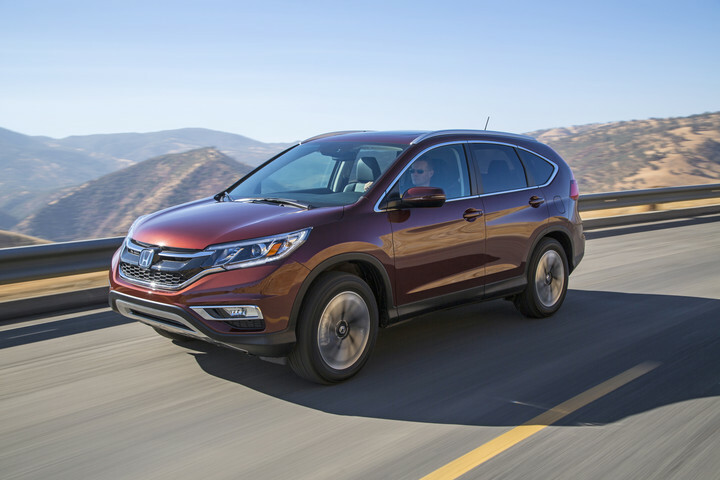 Earlier, the CR-V earned a TOP SAFETY PICK+ rating from the Insurance Institute for Highway Safety (IIHS), making it a collision safety leader and standout choice in the SUV market. In receiving the 5-Star Overall Vehicle Score from NHTSA, the 2016 CR-V has also met the requirements of the agency’s three recommended technologies: RVS-Rear Video System (back-up camera), FCW Forward Collision Warning and LDW Lane Departure Warning. The 2016 Honda CR-V utilizes the latest generation of Honda’s Advanced Compatibility Engineering™ (ACE™) body structure (http://bit.ly/1mj0noQ), which helps make the CR-V highly effective at absorbing and dispersing the energy of a frontal collision crash. The CR-V was the first Honda vehicle to offer the Honda Sensing™ suite of safety and driver assistive features that can take action to help avoid a collision or mitigate its severity. Honda Sensing™ is now available on four of Honda’s most popular and top selling models – Civic, Accord, CR-V and Pilot. The Honda Sensing™ suite of technologies includes Forward Collision Warning (FCW), Collision Mitigation Braking System™ (CMBS™), Lane Keeping Assist System (LKAS) and Lane Departure Warning (LDW). American Honda has a long history of leadership in the development and application of advanced technologies designed to enhance the safety of all road users, including automobile occupants, motorcycle riders and pedestrians. The company operates two of the world’s most sophisticated crash test facilities, in Ohio and Japan, and is responsible for numerous pioneering efforts in the areas of crashworthiness, airbag technology, collision compatibility and pedestrian safety. Based in part on advancements to Honda’s Advanced Compatibility Engineering™ (ACE™) body structure, Honda is a leader in third-party crash test ratings within the industry. The company also is broadly applying advanced safety and driver-assistive technologies such as LaneWatch, Forward Collision Warning and Lane Departure Warning to its product lineup. Also, all Honda and Acura vehicles have applied a rearview camera as standard equipment since the 2015 model year.